Ven. Jendy has offered enthusiastic support and encouragement for Sravasti Abbey since well before its founding. When the Abbey began to ordain monastics, Ven. Jendy was and continues to be instrumental in recruiting the requisite number of senior nuns and monks to join Ven. Chodron in giving ordination. With every visit, she shares her experience, insights, and guidance. Born in Taiwan, Venerable Jendy was ordained as a Bhikshuni in 1983 at Luminary Temple. In 1987, she later earned her Ph.D. in Education at the University of Washington. 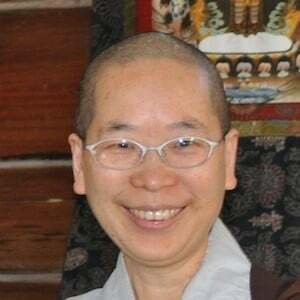 Venerable Jendy currently resides in Chi Yuan Temple located in Kirkland WA where she edits Buddhist teachings given by contemporary practitioners in both the Chinese and the Tibetan traditions into books. In addition, she teaches the Dharma to the nearby community. Among Venerable Jendy’s many Chinese-to-English translations are: Choosing Simplicity: A Commentary on the Bhikshuni Pratimoksha written by her teacher, Venerable Bhikshuni Wu Yin, and edited by Venerable Thubten Chodron. View photos from Venerable Jendy’s first visit to the Abbey in 2004. Venerable Jendy is also an Advisor.